You play as Daniel Garner, a man who dies in a car crash along with his wife, Catherine. While Catherine goes to Heaven, Daniel is trapped in Purgatory, and has to become a "hitman" for Heaven in orded to be reunited with his wife. The game takes you through many levels of different feel and designs, ranging from an asylum, a medieval castle or middle-eastern city to a modern-day dock, opera and military base. The gameplay is akin to that seen in the Serious Sam series - run and shoot, with no puzzles or any other elements to distract you from the action. 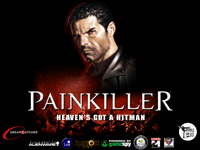 Painkiller includes boss fights with enourmous enemies, legions of different foes to kill, and great sound and music (both ambient and combat music). It has been expanded by the "Battle out of Hell" expansion, and has two stand-alone sequels (though neither of them is immediately connected to the plot of the first game): Overdose and Resurrection.